I am sure by now y’all ALL know who the amazingly talented Alex Boake is… But in the event that you do not, she is the awesome artist behind this and this and many more! I love all of her work so when she was looking for other bloggers to swap work with, I quickly jumped at the chance! How fun, I get to make one of her recipes and photograph it to go alongside her artwork? Duh, this was a no brainer! 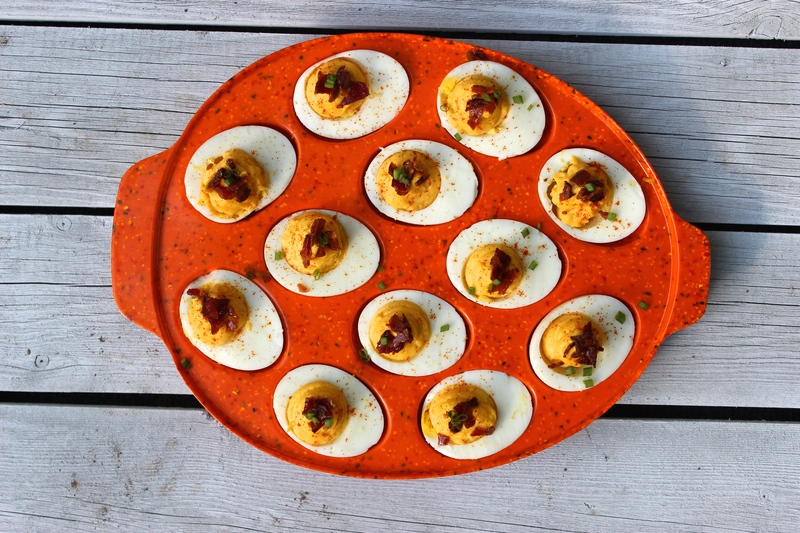 I picked her Smoky Bacon Deviled Eggs to make because they sounded phenomenal. Even now that I am sitting here typing away, my mouth is literally watering for them and it’s only been a week since I made them! Yes, they are that good. 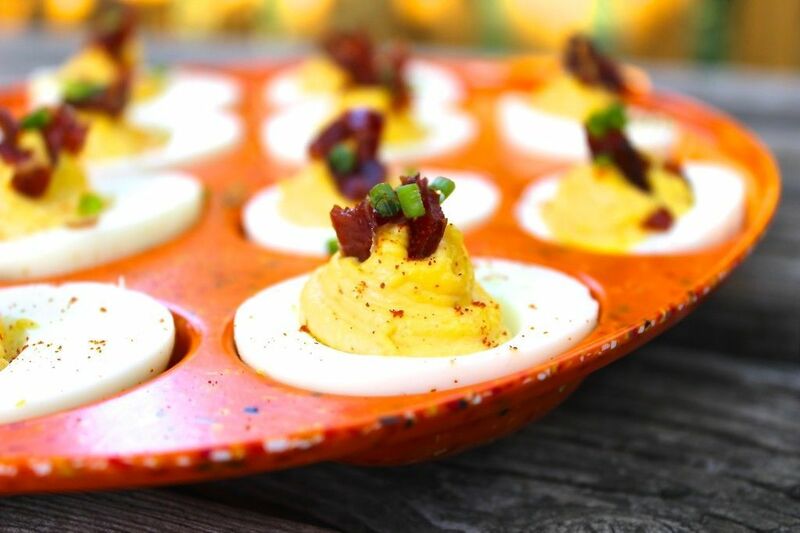 Deviled eggs + Bacon = silence around the table while everyone stuffs their faces. All 5 of us, quiet. This never happens. So without further ado, check these puppies out, go make em, and watch the veil of silence fall over your crew! Oh, and be sure to check her out of Facebook and Instagram for more illustrations and mouth watering food pics! You won’t be sorry! In a food processor, combine the Egg, Vinegar, Honey, Mustard and Salt. Give them a whirr to combine them well. In a measuring container with a pour spout, mix the Avocado and Olive Oils. These Oils both have a very mild taste, and won’t shine through too heavily in the finished Mayonnaise. Turn on the food processor and very very slowly drizzle the Oil mixture to combine. It is important to add it in as gradually as possible so that the mixture emulsifies and becomes thickened. Basically, if you can barely see the stream of Oil as you pour it in, then you’re on the right track! Once thickened, transfer to a jar and refrigerate for up to a week. Makes 24, great for parties! If you don’t have cooked Bacon on hand, cook up 6 pieces to use in this recipe. Make sure they’re nice and crispy. Hard boil 1 dozen Eggs. My preferred method is to put the Eggs in a large pot, with an inch or two of water covering them. Add a little salt to the water. Bring to a rolling boil, and then allow to boil for 1 minute. Turn off the heat, and let them sit on the stove, covered, for 10 to 12 minutes. Drain, and rinse with cold water. After that, transfer them to the fridge to allow them to cool. I recommend doing this the night before your picnic. Now comes the fun task of peeling the Hard Boiled Eggs. If your Eggs are really really fresh, you may have a hard time with this, as bits of the white will want to come away with the peel. Hopefully all goes well and you’re able to peel them all cleanly! Cut each one in half, removing the Yolk and transferring it to a mixing bowl. Lay out the empty halves like little boats on a serving tray, awaiting the filling. With the Egg yolks, add the Mayonnaise, Paprika, Chili Pepper, Salt and finely diced Bacon. Mash them together using the back of a fork until relatively smooth and well combined. If you want to get really fancy, you can transfer the mix into a piping bag, and pipe them back into the Egg boats. Usually I just use a small spoon, and plop the delicious filling into the Eggs. Either way, once it’s evenly divided and all used up, top each one with a small piece of Crispy Bacon! There you have it, a fancy appetizer that will get you invited back to all the hottest picnics, year after year.